Think you know everything there is to know about Destiny 2? Then tell me, what sort of music would the freshly-introduced villain Ghaul listen to? Game director Luke Smith addresses that question and many more in a new interview with Wired, and though the video is a little over 20 minutes long, do yourself a favor and set aside time to watch the whole thing. For those of you who don't have time to spare, let's cut through to some of the biggest questions and the best answers. "The loot cave was a pretty fun time in Destiny 1. What it showed us was that the game that we shipped in 2014 was a game that people wanted to play, and that it also wasn't rewarding enough. What we've tried to do with Destiny and now Destiny 2 is make the game feel pretty rewarding so that standing in front of a cave, shooting into it, isn't the best way to play it." "You're gonna enter the world a little differently than people who didn't play D1. Will you need to buy it on the same platform for them to work? The answer to that is yes. If you're an Xbox player, in Destiny 2 on Xbox we will remember and show you that we remember." 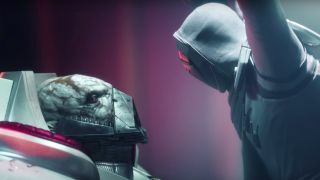 "While we were building the Taken King, we had an idea about what was coming next, and we knew it was going to be about the Cabal. We had a mission where you learned a little bit about the fact... I believe the mission was called 'Outbound Signal,' and the outbound signal was in fact a signal - I believe it was a signal from the Cabal ship that crashed into the Hive Dreadnaught that was beaming a signal out to the Cabal empire. With respect to the Vex, the Vex don't play specifically a role in the conflict between the Red Legion, but while you're playing through Destiny 2 and while you're playing a bunch of the different content, we are pointing at places we're gonna go next." "Yes. … It doesn't mean you'll be able to change all the damage colors, like for your Exotics. It does mean that you'll be able to look at a Hand Cannon that you love and be like, 'Oh man I'm gonna change this to Solar because I know this week the Cabal Strike in the Nightfall playlist has a bunch of guys with red shields." "I don't think this was in the beta, but when you pop the shields and they match, in the shipped game... so if you're shooting a red shield with a red gun, it creates this pretty large AoE explosion that deals damage not only to the character whose shield you just popped - so they take sort of double damage on the shield pop - but also stuns the character so they like, freeze, and you can keep shooting him, but the AoE will also blow up a bunch of the creatures around them. So that damage match game becomes more important and more fun." Will Destiny 2 have a patch test realm? "I wouldn't say never, but I wouldn't say yes." What's the best power weapon? [Referencing a link to YouTube] "If I was to guess, without watching the clip, without making it play behind me, it might be a fusion rifle. The fusion rifles were a little hot. They were a bit strong. And so we are gonna tune them down just a smidge, to bring them in line with the other power weapons. We've looked at things like sniper flinch, sniper sway and tried to reduce that. We've done things like increased rocket damage against the monsters. We hope there isn't a best when the game ships." "I didn't ask a version of this question internally, but I did ask another question about Exo's capabilities. Because I did wonder. Y'know, it's a robot. Like, is it... like, you... like... like, is it all robotic?" "Of course. Yeah, Cayde of course can eat ramen. Like, of course he can. Cayde can eat anything you can eat, and I guess he really likes the spicy ramen." What type of music would Ghaul listen to? "True story: I actually got some folks from the team together to talk to them about this question because I wanted to know the truth. The answer is music that would make him feel superior. Suggestions included things like jazz, prog rock from the '60s and '70s. Like maybe Ghaul's really into RUSH. Although, in my head, if I were Ghaul, I think I might listen to some of that stuff from Moana. I really do. Moana's good stuff. You should check it out."